Marshall delivers on her best album yet. Susan Marshall is arguably the contemporary Memphis scene's most powerful and versatile pure singer, and, with this third solo offering, she delivers her strongest album yet. Little Red is a mix of covers (four) and originals (five), all united by Marshall's consistently electric vocals, which grab you whether going for calm or thunder and all points in between. Another cover/guest-star combo is Marshall's take on the Beatles' "Don't Let Me Down," which turns out to be the perfect Fab Four song for someone like Marshall to cover, because it's a great skeleton for a singer to flesh out. You can pay attention to the performance rather than the composition. And in this case, it's Marshall trading vocal riffs with Lucinda Williams, whose refrains are more familiar but less dynamic. And the great Teenie Hodges laces a gritty Hi-style guitar riff into the Marshall original "Oh My Soul," which gets increasingly bluesy and hypnotic, like classic Hi meets hill-country blues. Marshall worries her way around it beautifully. 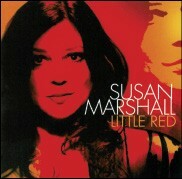 Susan Marshall performs two record-release shows for Little Red this week. On Friday, April 24th, she plays the Warehouse (36 East G.E. Patterson, in the South Main Arts District). Showtime is 9 p.m.; admission is $5. On Sunday, April 26th, Marshall plays Itta Bena, above B.B. King's Blues Club on Beale Street. Free admission for the 5-7 p.m. cocktail hour. Reservations required for dinner. Marshall performs at 7:30 p.m. Call 578-3031 for more information.